I made this block using the Reflection print (27174-15) from my newest collection, Daydream. Download instructions for how to make this letter block. New pencils. I guess drawing was in my future! Any movie with Paul Newman in it! I think i answer this question the same every time just so i can include his photo. New fabric, New projects! Here's an inspiration board i put together for Daydream. To me, every fabric collection i design is a New creative adventure! Now that's a dreamy idea! the day after tomorrow just as well. The words look so small, but have been powerful, motivating forces for me. 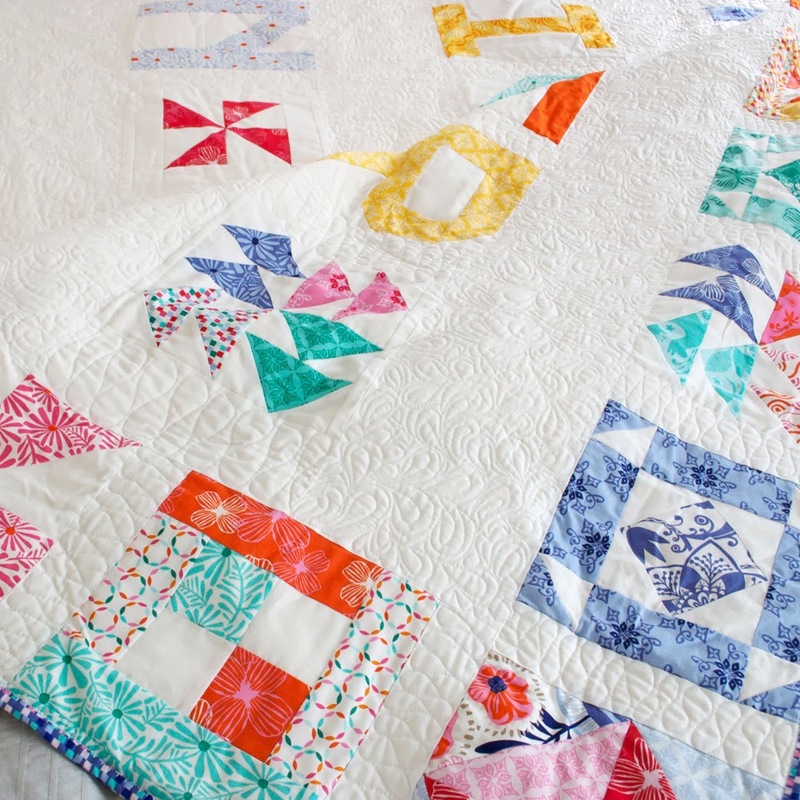 I made this quilt using Daydream, some Moda Bella Solids and Moda's alphabet instruction book that you're gathering along throughout this blog hop. Maybe you have an inspirational quote you'd like to make into a quilt too! ... and Franny photobombed my shoot! Here's a detail of some of the quilting i did on my Janome...which is kind of a swirling Daydream in itself. I absolutely love the meditative flow of free motion quilting and find it's a lot like doodling, only with thread. Nuts. If i had to pick a favorite — which would be really hard — i'd have to say cashew. the incredible bowerbird in action. introduced me to Moda Fabrics! Nine Patch. It's sweet, simple and satisfying (i couldn't think of three things that started with "n" so figured i'd try to get you excited for the letter "S" day). Is there an object, tool or anything that you cannot work without? Yes, that's appropriately on my side of the bed! Moda has it available on their website as a free download. Or if you'd like to purchase a printed pattern, you can do so on Fat Quarter Shop. The second thing is a giveaway! Moda has generously provided a jelly roll and fat-eighth bundle that i'll be giving away to two lucky winners! Just leave a comment letting me know something you're Daydreaming about these days. Only one entry per person, please. Winners will be randomly selected and announced here on February 28th. Good luck and thank you again for stopping by! I am day dreaming about spring after a long cold snowy winter here in Michigan. 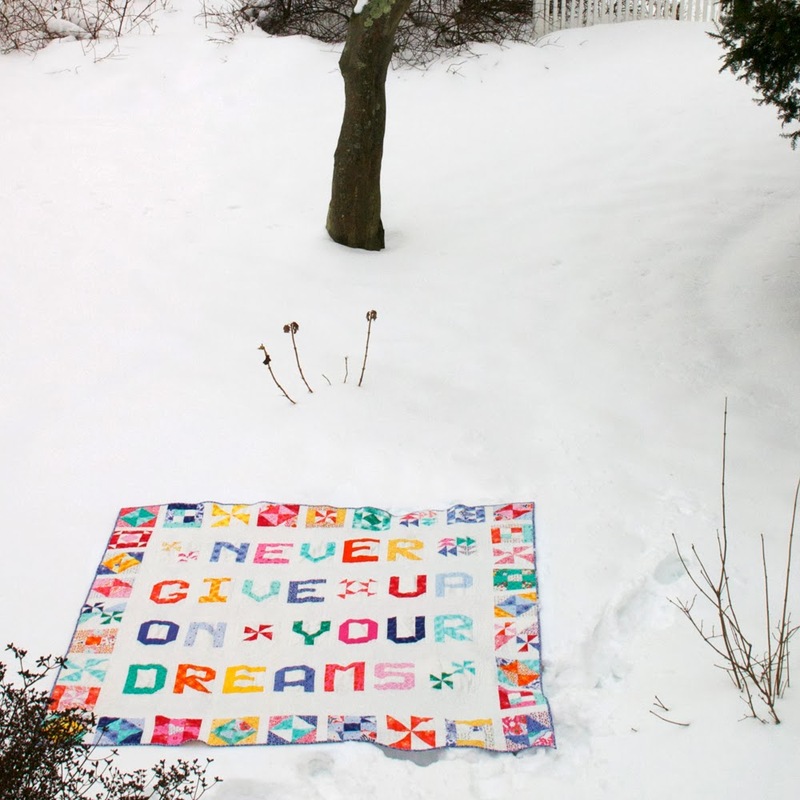 Love your Dream Big quilt. I'm daydreaming about having no marking to do and therefore more time to sew. Alternatively, I dream about an end to this awful wind and rain we are having in the UK at the moment. I'm daydreaming of setting up my sewing room in our new house. We get the keys on 28th Feb - same day as the prize draw so here's hoping that's a lucky omen and a great start for my new sewing space. P.S. 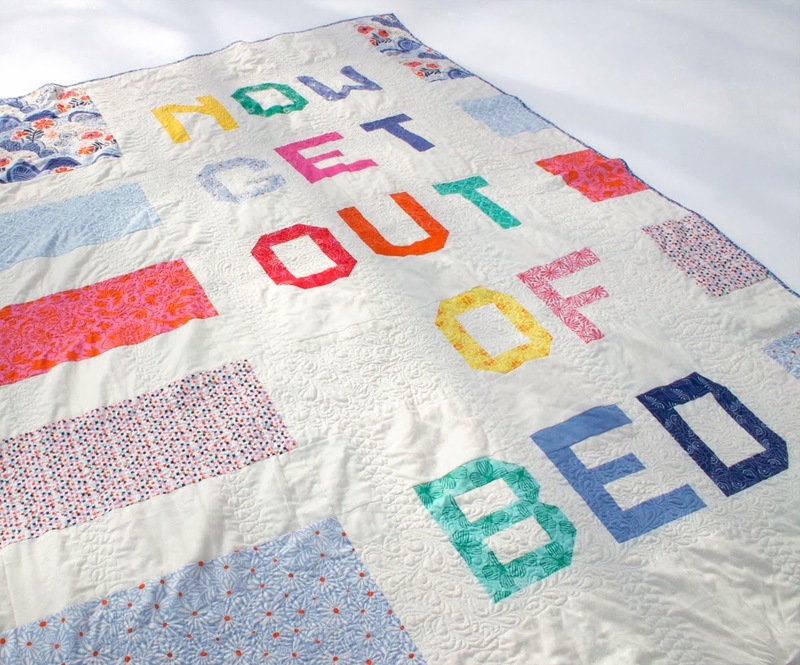 Love, love, love the back of your quilt - genius! I'm dreaming of the day that I've given up work to spend the whole time sewing and quilting whilst my imaginary cleaner absolves me from guilt! Hmm.... I think I'm daydreaming about having unlimited time to sew (instead of the little snippits that are really what I get!!) 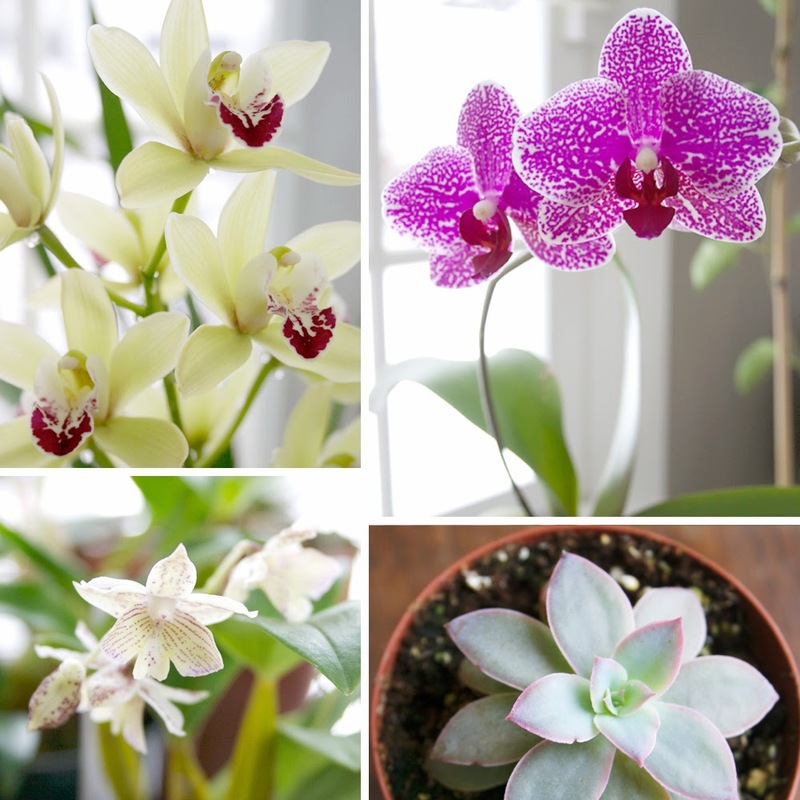 Thanks for the lovely post, the free pattern, and the fabulous pictures of the orchids!! I'm daydreaming about SPRING. We have had an unusual winter in Florida and I am ready for flip flops and shorts. I'm daydreaming a lot about what I would do if I won the lottery. Imagine the time I would have for quilting!!! Daydreaming about a good future for my kids, will it involve moving and perhaps a new home and new country. From your blog post you have definitely given me something to DAYDREAM about today! Your new fabric line! I soooo love your word quilt and your photo bombing Franny reminds me of my two kitties who love quilts also. They are always in my pictures of quilts. Hope to win! Thanks for hosting! A quilt shop is on my bucket list. I want to Modasize the interior with all Moda fabrics. You fabrics are beautiful Kate. Right now I am daydreaming of Spring. It has been a rough winter here so far. I can't wait to get outside! Spring and warm weather, trees with leaves, tulips, fresh air, no heat. I won't be original in saying that I'm dreaming about spring, but apart from that I'm daydreaming about finally trying out the quilt ideas that have been sitting in my head for a long time. I LOVE your quilt and the back especially. Fabulous against the white snow backdrop! I'm daydreaming of more time to sew and a house that becomes organized all by itself. I've been daydreaming about actually sewing! I've been working a lot this week and wishing I was at my machine the entire time!! Daydreaming about an upcoming vacation in a warm and sunny place. I'm daydreaming about finishing all of my UFOs so I can start some new projects and top of my list will be your version of the alphabet quilt for my daughter. Daydreaming about SPRING. After a record snow and cold, it cannot come soon enough. I've been daydreaming about our "Forever House." My husband is in the army and is retiring later this year. 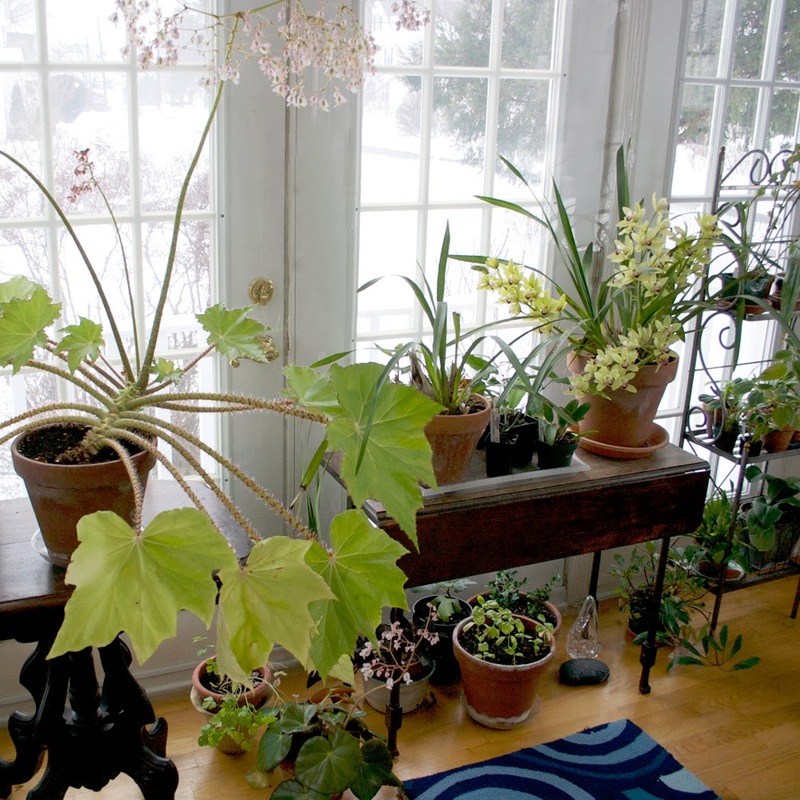 Moving every two years or so and living in amazing places had been great, but I'm so looking forward to having my own house--a place where I can plant perennials instead of annuals, paint rooms any color I wish, and put down deep roots. Thanks for the giveaway! Beautiful day dreaming fabrics, it certainly makes me daydream about the spring weather returning after this long winter, cannot wait to see the flowers come up through the ground. I'm daydreaming about spring and working in my garden. Seems like spring will never come. I love your Daydream fabric. Just beautiful! I'm daydreaming about quilting and binding the quilt tops I've pieced! I really need to do that! I also had a "night" dream last night about a name for a new fabric line---sounded perfect for you---Serendipity. 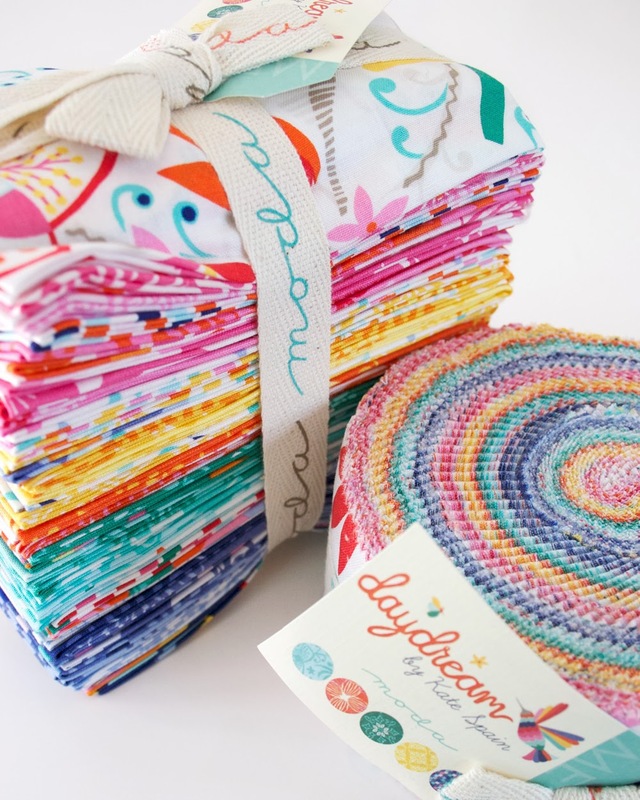 Thanks for the chance to win some Daydreams fabric! I'm working on a mini quilt using that right now--so happy and fun! This morning as I listen to the sounds of freezing rain, thunder & high winds, I am dreaming of SPRING!!! I love your colorful fabrics and your inspiration nature photos were very much enjoyed! I'm daydreaming about a day when we aren't under a fire weather watch here in Oklahoma. Like a lot of people, I'm daydreaming about warmer weather and getting rid of all this snow! Thanks for the chance! I'm daydreaming about have a house near the beach.I`m still dreaming!! I'm day dreaming about the beach, that fresh ocean breeze! Well, it doesn't always smell so fresh - but this is a daydream, right? I am daydreaming about warm weather. Winter has been too long. I am daydreaming about fine spring days after this very wet (but mild) winter here in the UK. I'm daydreaming about owning my own fabric shop. There aren't any nice ones nearby. 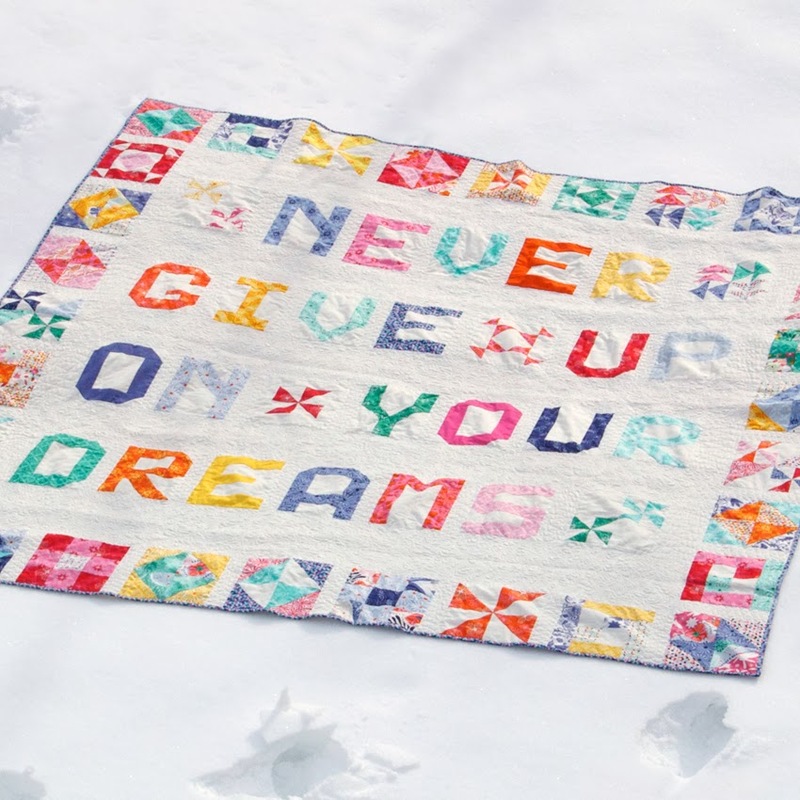 Love you dream quilt, very inspirational. I'm definitely dreaming of Spring. With the coldest and snowiest season in a very long time, warmth and sunshine would be ideal. The one good thing I don't feel guilty sewing since the weather isn't very good. Thanks for the chance to win such beautiful fabric. I am so daydreaming about Spring. Having woke up to 10 more inches of snow, I am tired of winter. Love your fabrics and thanks for a chance to win. Daydreaming about picking up a paint brush again after too many decades of not doing watercolors. Daydreaming about all the quilts I want to make. Just want to sew all the time. I love your fabric! I am dreaming of going someplace warm. It has been a very cold snowy winter and more snow is predicted. I'm daydreaming about taking a vacation with my daughter. I love your 'Dreams' quilt. Spring!!! Will it ever get here? Thanks for the chance at that beautiful fabric. It seems I'm always daydreaming about a new project or new fabric. Daydream looks like another great fabric collection! I'm daydreaming about warmer weather, it has been an especially cold and icy winter in my part of Kentucky this winter. I've been daydreaming about going on vacation to Fiji with my husband! Been too long since we've gone somewhere - alone that is lol! I enjoyed working with sunnyside goes with my daydream - think on the sunnyside! I'm dreaming of Nice sunny spring days. Summer! I am daydreaming about a warm ray of sunshine! I have been daydreaming and planning a new garden walk and patio once the snow and cold finally leave. It has been a long winter. I'm dreaming of spring - blooming flowers, budding trees, green grass...especially after such a cold winter! Love your fabrics - made an adorable quilt with your Cuzco line for my great niece. She loved it! I am daydreaming about winter blasts being over and sunny days soon to come. Love your new line! I'm day dreaming about getting a 7 hr sleep..my 23month old is still not sleeping all night thru...thanks for a fun hop! I'm always daydreaming about new quilts to make and UFOs to finish. I've been daydreaming about strawberries. When we loved in SC we were 4 mins from the strawberry patch. I loved taking my daughter out to pick and seeing her face covered in strawberries. Now we are in Texas now and the closest strawberry patch is 151 miles. Sigh. I am always daydreaming. Even in school my teachers said I was a daydreamer, when my parents went to the parent-teacher conferences that is what they always heard "she is such a daydreamer" This fabric suits me just fine. As for what I am daydreaming about right now. Having an entire week off work to do some quilting (therapy) with all the ideas that I have stuck in my head, I need to get them out! Thanks for the chance to dream again! How lovely! That quilt is just gorgeous! And I do love your fabric...I have a little stash of it...one of these days I'll sew myself something beautiful with it. Right now, I guess I'm daydreaming about summer. We're in the middle of a homeschool year and summer vacation is sounding very, very appealing right now. I guess the only problem is, I have to wait until the end of August to go away, LOL! Then it's back to school again. Thanks for a chance to win that gorgeous fabric! Your fabric makes me think of sunshine and flowers - so I guess I am daydreaming of summer right now. Heck I would settle for spring any thing other than all of this snow and cold. 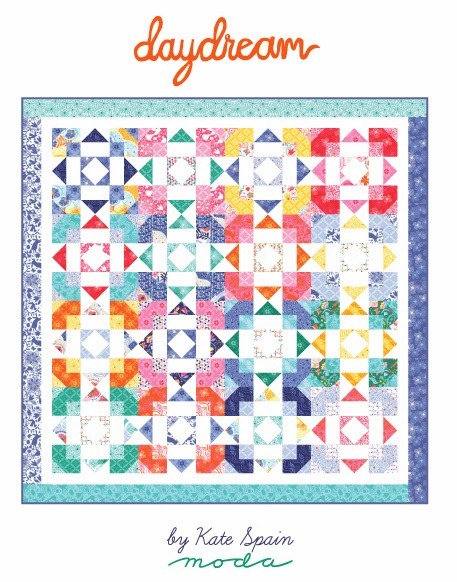 I'm right now daydreaming about quilting as well as you do on my Janome! Nice work and great new fabric line! 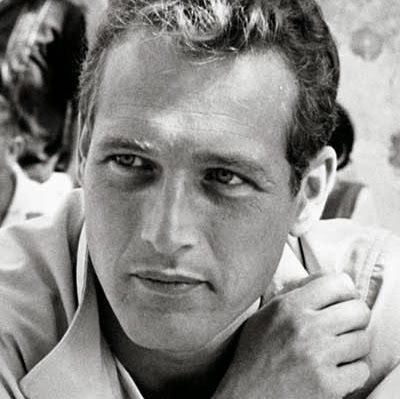 Well, now I'm daydreaming about Paul Newman and I think I'll have to pop my Cat on a Hot Tin Roof dvd in and then sigh and melt. I've been daydreaming about having some of all of Kate Spain's fabric collections. Love, love, love everything you do! Thanks for sharing your creativity with us. I have always daydreamed of being a weather girl. Isn't that funny. My husband thinks so. I'm daydreaming I will will one of your beautiful FQ bundles!! My daydreams lately are of sunny, warm days and new spring freshness. It has been a long, cold winter in the northeast. I can wait to see my tulips coming up in all the colors of your fabrics!! I'm daydreaming about winning a beautiful FQ bundle!! oh my, I'm day dreaming about a Gammill long arm. Also a trip to Ireland! a girl can dream right! 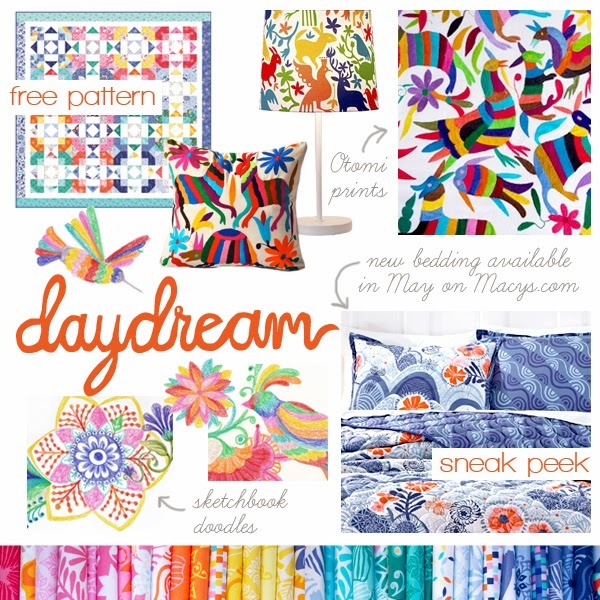 can't wait to make a quilt from the day dream collection. I'm constantly daydreaming about quilts, quilting, piecing, applique. Which one of my current projects I'll work on if I have a moment, which I'll start next, which fabric I need to get my hands on (frequently yours) ... all good stuff. I'm daydreaming of a Martha Stewart garden...I'd love to have a new fence and new raised beds and beautiful flowers growing there. I'm daydreaming about the move to the country in a couple of weeks and a new craft/sewing room to play in! I think we all have the same answer. I'm definitely daydreaming about spring. I'm also daydreaming about making a quilt using this gorgeous fabric! Maybe Gypsy Kisses? Im daydreaming about fixing my car that just broke down and not losing my house. Not fun, but true. Thanks for the giveaway! Of course, I am daydreaming of spring and an end to this brutal winter. Sun and warm weather is my daydream. I also daydream about what my next quilt project will be with your bundle I hope to win. Thanks for your giveaway. Like everyone else in the entire country, I'm dreaming about SPRING!!! Gorgeous, glorious, twirl myself around in the warmth in a field of flowers, SPRING!! Your fabric line says it all. Thanks for the giveaway! I'm daydreaming of spring, with warm weather and no snow. Besides new fabric and a sewing room, I am dreaming of a spring with no more winter storms and bitter cold! I am daydreaming about the coming of Spring and the beautiful flowers and weather! i am daydreaming of warmer days to come. This week we have gotten 3 feet of snow. I LOVE your daydream quilt. Thanks for taking part in the giveaway. I am currently daydreaming about long summer evenings, its been a long dark winter! I'm always dreaming of new projects and quilts to be made and fabric to purchase. Some never come about but it is good to plan and dream. thanks for the giveaway. I love your letter bed quilt. Great post Kate! 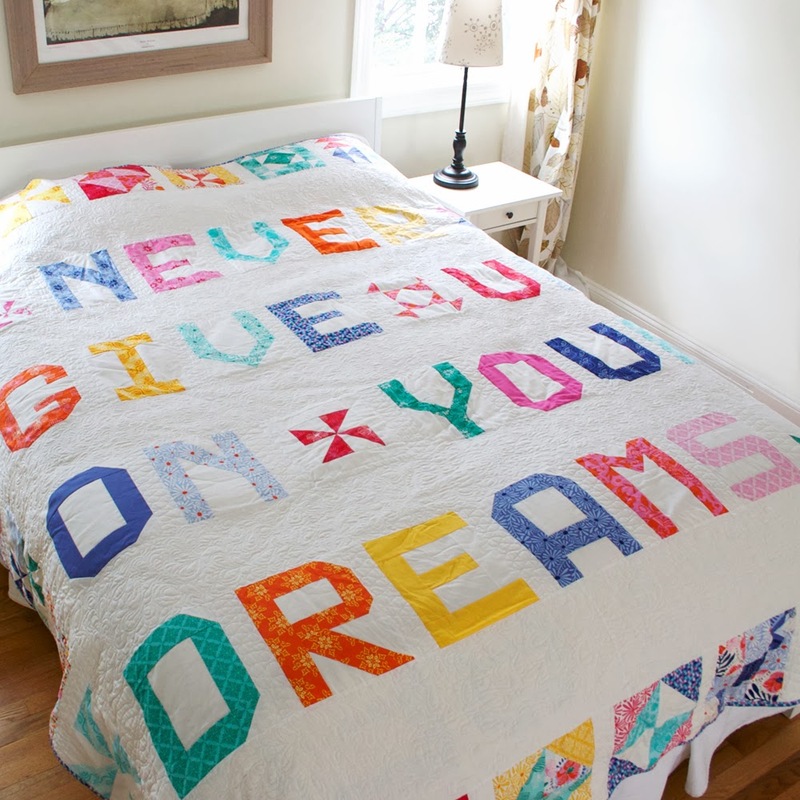 I love your Dream Big quilt. I am always daydreaming about what quilt I want to make next. Now it's time for me to "get out of bed" and walk my dog! Thanks for the chance to win. I totally enjoyed your post...your Daydream quilt is outstanding!!! Love it!! It is so bright and colorful...you are so creative:) I daydream a lot about what I want to quilt...your quotes are for me! Sometimes I am so busy daydreaming that I do not get to my project! Have a Happy Day...love the giveaway! Wow, those orchids are beautiful. And the cats don't eat them? I've been daydreaming about my new longarm...one day. And a job, cross your fingers! I'm daydreaming about my kitchen remodeling that if finally going to happen this summer. Thanks for being a fun part of this blog hop. I am daydreaming about Spring! It has been a long winter here in MI. Can't wait for the strawberries! I daydream each day about my time spent in Santa Barbara for 4 days next week with my quilt friends. Lots of laughter, fun and working on my UFOs. I am daydreaming about my spare room and how the quilts I am working on will look on the beds once they are done - can't wait. Hope I get to see this daydream materialize before Spring!! Since I recently moved, I'm daydreaming about having my new little sewing room unpacked and organized! Can't wait to sew again! This year I am FINALLY going to cut into my stash of Terrain. I think it is my all time favorite fabric line. I'm daydreaming about summer! Thanks! I am daydreaming about summer and being able to get out of the house and enjoy the pool , the scent of summer flowers and watching all the different birds that feed at the feeders. Love the hummingbird fights. I'm dreaming about having the freedom to roam around camping in our Westfalia. The Westy has a new owner and we are in a transitional period that doesn't allow us the free time we once enjoyed. It's a new adventure and a fun one at that but we still miss the Westy lifestyle. I've been daydreaming about having another baby - no, it won't happen for me, but that's okay, daydreaming about it is enough. I was kind of dreading it last month, but now I am daydreaming about summertime and the ocean. All the spring fabric lines are putting me in the mood for warmer weather! Of course as soon as the skin melting heat gets here, I will be daydreaming about winter! I daydream about the awesome family cruise we will be taking in 1 month. I am so ready for warm, gorgeous weather! I'm daydreaming of the sunshine that is bound to be here soon. I'm daydreaming of spring, sunshine and flowers! I am daydreaming of a vacation on a beach, the warm sun on my face and the sand between my toes! I'm daydreaming about spring! All this snow gets me down, spring is so light and fun! Thanks for the opportunity to win. My email is qltdiva1@fuse.net. Thanks! I'm daydreaming about moving back home to be near my family. Your Daydreams fabric is wonderful. I am daydreaming about time to sew. So many ideas swirling and just no get t done time. I'm daydreaming about spring and getting back outside for biking! I'm daydreaming about our tax return. And, as usual, time to sew. It's tough with a two year old who can be playing quite happily by himself until he sees me sit down at the machine. I daydream about having a bolt of every fabric in the Daydream collection! I love it! I am daydreaming about a warm and sunny vacation. I am not too fussy on the location as any place that does not have snow falling will do just fine. Even though it hasn't been bad here compared to the rest of the states, I'm dreaming of warmer weather (and yes, I'm even willing to suffer the 100 degree days..I HATE the cold!! LOL). Thanks for the giveaway! I've been daydreaming about finishing my I Spy quilt! I've been collecting fabrics for what seems like forever! Thanks for the chance to win! I am daydreaming about finishing grad school in a year and a half - all my free time goes to homework and studying and I would rather spend it being creative and making quilts for people! Dreaming about summer, shorts, flip flops and swimming pools. I'm daydreaming about Spring and redoing my kitchen! I'm dreaming about new beginnings. After 23+ years of military service, my husband is retiring this summer and I'm excited to see what's in store for us as we begin a new chapter! I am day dreaming about retiring so I can play with my granddaughter more. I'm daydreaming about Retiring,which will be next year. And how blessed I am. I know this seems obviouse when you live in Iowa, but I am dreaming of Spring. Yesterday we received 8 inches of snow and high winds, making for a blizzard in our area. Luckily I did not loose electricity like some of my neighbors so I could continue to sew. I've been dreaming about my upcoming trip to Hawaii. I can't wait til March 5. Daydreaming about the time in my life where I don't need to work and I can create my day to revolve around my creation of sewing projects - quilts, wall hangings, etc. I'm dreaming of growing old with my husband, and see that all five of my children are happy, healthy adults, one day. I am dreaming of a day when I have no more pain from Multiple Sclerosis, and the limitations are all gone. That is why I guess quilting makes me feel so good about my self and how far I have come. I am dreaming of better days to come, each and every day. I live in Ottawa Canada and I am also dreaming of Spring. It has been a long very cold winter and I am so over all of the snow and the cold weather. I am really looking forward to wearing lighter jackets and not having "hat hair" from wearing a toque!! Spring flowers blooming and spring birds migrating through as they stop to visit and sing their songs. Surprise of who arrives today at the feeders. Ii been dreaming about a sewing room makeover! My daydream is to move to the country with mountains, and all four seasons. Living in Florida is becoming boring with all the HEAT. I have been daydreaming about warmer weather and sunny days. Tired of all this snow and extreme cold! Thanks for the opportunity to win your fabric giveaway. I've been daydreaming about the arrival of my 4th grandbaby! Thanks for the pattern and giveaway. I love your quilt! I have been daydreaming about a grandchild. My daughter & son in law have been trying to adopt for 2 years now. I am patiently waiting & daydreaming. I'm also making a great big hope chest of really cute things for this grandchild! I'm dreaming of spring when I can plant beautiful colorful flowers to my outside world. I have been daydreaming about having enough time to sew all the quilts I have in progress and all the new ones I want to start. Of course I would want to sew in a lovely place by the beach so I could go out walking when I needed a break. With room service and someone to tidy up after me. Sigh. I am daydreaming about summer sitting in the yard working on a quilt and watching the Hummingbirds flit around. 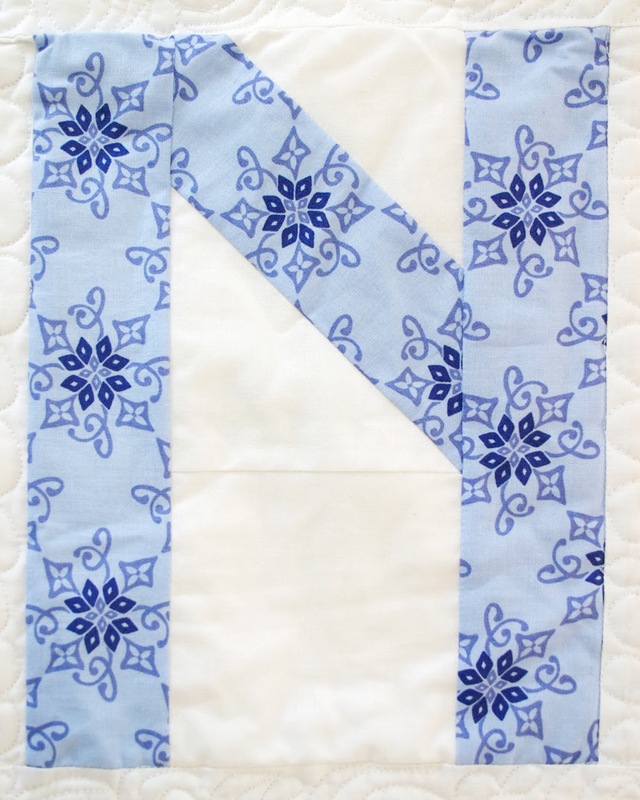 Great post and thank you for the quilt pattern. We are currently having our 7th snow day of the school year. No question I'm daydreaming about summer golf. Day dreams of cherry pie or fudge or French fries...do you get that I've just started a DIET? I am daydreaming about get busy and making quilts for all the fabric I have in my stash!!!! I daydream and night dream about all kinds of quilting projects. I believe it's turned into an obsession instead of a daydream though. :) I love your motto and the quilt you made with it! Since we had another huge winter storm last night, I am daydreaming about spring! Thanks for the chance to win! Daydreaming about restoring a vintage (Airstream, yea, I am really talking about daydreaming) camper with all kinds of MODA !!!!! Wouldn't "Daydream" look totally "awesome"! Kate, your cat looks exactly like my Rocky. Love your new line. Daydreaming about? Hmm how about no more cold weather, shoveling snow, getting stuck in the driveway (what's up with that?) slipping on ice walking to mailbox, lights flickering cause power lines are sagging, yeah sick of winter and ready for spring! Bring on the bluebirds!!!! I am definitely daydreaming about becoming a much more accomplished FMQ'r. Just starting out. Want to do as beautiful as yours is!! Love the cat, mine do the same on my bed. Thanks for the giveaway! Nice!! Daydreaming of more time to quilt!! The fabrics are gorgeous! Thanks for the giveaway! 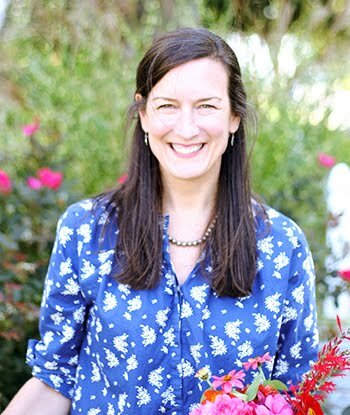 I know it's a quilting blog, but I am daydreaming of my garden and what is possible this spring and summer! Spring is what I am daydreaming about. Lately I've been daydreaming about warm breezy weather and tropical flowers. Thanks for the chance to win! 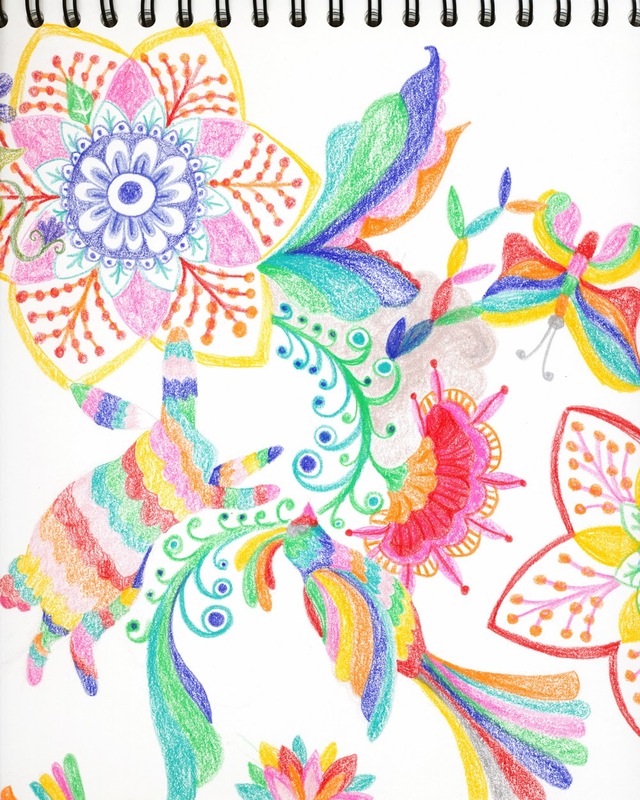 I daydream about colors outside other than grey and white!! I am daydreaming about spring, gardening, long walks outside and the sun! I am daydreaming about having an extra 2 hours every day to sew in ;) Wouldn't that be swell ;) And I love, love, love the Now Get Out Of Bed on the back of the quilt. That is awesome! I daydream of going on a Road trip with the 'girls'...my quilting buddies, visiting all the Quilt Shops on our Wish List!! Now wouldn't THAT be a blast!! Thanks for a chance to win your lovely fabric...gorgeous stuff!! Making a SPRING quilt for my Living Room wall! I'm daydreaming about a host of minions unpacking all the boxes in my house since I just moved across the country. ;) Until the minions show up, I'm daydreaming about quilting since all I've been doing is unpacking LOL! Thanks for the chance to win your beautiful fabrics! I am daydreaming about summer...warm weather...leaves on the trees...longer days...kids splashing in the pool...cooking foods outside on the grill...relaxed schedule...sunshine! I am daydreaming about Sunshine and warmer weather. It has been quite the winter here in PA. I am daydreaming of Nice weather, here in Indiana. And visiting my Grandson, Noah, in North Carolina. Also, deciding on what quilting project to work on Next. I'm daydreaming about spring with all the wonderful colors, sunshine, and warmer weather. I am Daydreaming about a quilt retreat coming up in a week! I also LOVE this latest fabric line of yours! Thanks for the chance to win! I'm daydreaming about the beach this summer. I am over this winter with all the snow and ice. I have been daydreaming about the day I finally graduate college (at the age of 37, because we never give up on our dreams!!) and can spend my free time making all the quilts I have been planning to make for the past 2 years!! I am daydreaming about finishing my Christmas Tree Quilt before next Christmas. I've been daydreaming about being by the ocean. Thanks for the chance! I am daydreaming about sunny weather and little league games. Might need a new picnic quilt! That's easy - with all the snow and rain and sleet we had yesterday I am daydreaming about Spring! Thanks for the give away! I'm daydreaming about a trip to Alaska DH and I want to take someday! Daydreaming of Spring and of starting my next quilt project! I'm daydreaming about my next quilt project!!! Daydreaming of this fabric. :). Saw it in the store yesterday, dreamy! Also of becoming a Yoga teacher. My classes start tomorrow. Yay! I am daydreaming about warmer weather!! I am daydreaming of being finished with my current quilt projects! I just made a table topper with your Daydream fabric that I got from Sherri McConnell's blog....that is the prettiest fabric! I'm in awe! I'm "daydreaming" of NO SNOW! I too am daydreaming about Spring's approach- A sunny warm spring day really boosts my energy . Thanks for the chance to win that colorful fabric. The July day my niece gets home from South Korea. We are going on a vacation!!! I have been daydreaming about redoing my sewing closet! I have saw some wonderful ideas for neat, organized and beautiful sewing/craft closets. Can't wait for my to look like that instead of a mess. Thanks for the giveaway!! I am daydreaming about finishing some sewing and quilting projects to decorate my sewing room. After the winter we have been having I am daydreaming of spring. I can't wait to get out in my garden and enjoy the sunshine. What I'm daydreaming about these days is Spring. I'm tired of the cold weather, I want warmer days and lots of flowers. Love your new fabric line! Daydreaming of spring flowers to brighten my day! I am daydreaming of the day I get to retire and quilt full time. What a lovely post! By nature, I am a daydreamer, so there are many things I daydream about, but a recurring theme for me is to daydream about fabric projects that I want to make - and planning them out in my head. I had to chuckle at the kitty photo bomb - so typical of our little fur babies! I am daydreaming about walking bare foot on warm green grass (so tired of the boots sloshing though the snow) - a great give-away and thank you! After ten inches of snow, I am daydreaming of SPRING. Getting a glimpse of spring already....so, what I am daydreaming about is the sort of projects I am going to do with all these letters! The possibilities are eNdless!